I am one of four demand planners on the purchasing team. As a demand planner, I am responsible for the sales forecast for my assigned vendors. The majority of my time is spent loading forecasts for upcoming promotions and campaigns. The forecast then triggers the buyers to purchase the inventory needed to support the sales. I speak with vendors throughout the week to discuss upcoming promotions, current inventory position, and the sales forecast. Supplementation doesn't happen if we don't have the inventory in stock in the right fulfillment center when the customer needs it. Bill is one of our most tenured employees, serving the company for over 13 years. Now that's loyalty! I've been blessed to be a part of a company that values its employees. As the company MVP in March 2011, I was able to take a trip to Northern California and spend a long weekend in wine country. I've had the opportunity to grow with Bodybuilding.com both personally and professionally over the years and know opportunity awaits! Describe your job in three words or less. You've got to be a driven, forward thinker. Times are changing, and there is more competition than ever. It started out as a summer job in 2000. My first week on the job, the founders were celebrating one of the many milestones—reaching 250 orders in one day! 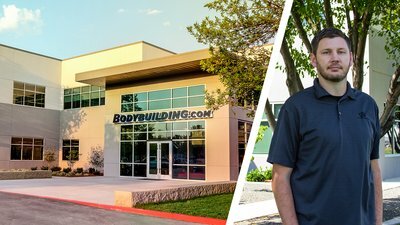 I spent the next two summers working for Bodybuilding.com, each of which were spent moving into a larger warehouse. As the company continued to grow, it became clear to me that this was where I wanted to start my career. I moved back to Boise in 2003 and was hired full time as the receiving/inventory manager. I spent the next five years learning the business, managing inventory, and working with our vendors. In 2008, I was promoted to the first buyer position. Over the next four years, we implemented new software and built a team of five buyers and one demand planner. My most recent promotion was to my current role as demand planner. Where do I start? We truly change lives! The customer and employee transformations over the years have been amazing. The continued support of local charities, the donation/building of the outdoor gyms in Ann Morrison and Camel's Back Park and the newly formed Lift Life Foundation speak for themselves. Bodybuilding.com is known for awesome benefits and fun culture. What is your favorite perk or aspect of company culture? Bill, ready to conquer the Boise Dirty Dash fun run. The quarterly team-building events are awesome, but I think my favorite is the sponsorship program. Bodybuilding.com has sponsored me in golf tournaments, the Dirty Dash mud run, softball teams... The list goes on. On the white rapids of Idaho, the operations team takes a break from the office for a team-building activity. I'm lucky to have built great friendships through the various Bodybuilding.com sponsored flag football, softball and basketball teams. The team-building events are a great way to get to know co-workers outside the office. We've also got a friendly ping-pong rivalry that's developing among the team, and we often close out the week with a cold beverage at a local spot, WilliB's Saloon. Being part of a culture that lives and breathes fitness for so long, it kind of becomes instilled in you. The continued involvement in company-sponsored teams helps to keep it enjoyable. The newest and sweetest member of the Baldry family, Hattie Grace, arrived June 2016. My family keeps me motivated to be healthy and active. As a family, we like to get out and hike in the foothills and ride along the greenbelt. In the winter, we spend our weekends skiing. Recently, we had our first child, Hattie Grace Baldry, born June 6, 2016. Our first week at home was crazy, stressful, and tiring. You quickly adjust to the lack of sleep. She's changed so much in the last three months, but it's getting fun as she starts to develop a personality. Bill and wife Erica watch the Chicago Cubs at their training facility in Arizona. I'm a huge Chicago Cubs fan and was lucky enough to travel down to Arizona this spring and enjoy a couple spring-training games. This is the year we break the curse of the Billy Goat and win the World Series!